You are a member of the S.P.C.A. 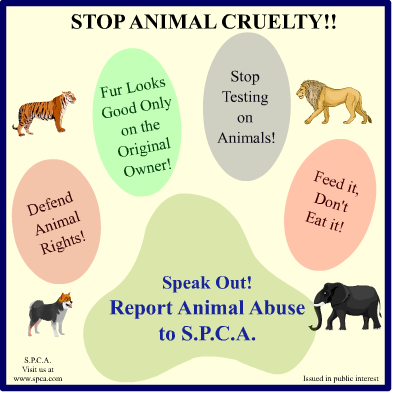 Draft a poster in not more than 50 words, to create awareness on the need to prevent cruelty to animals. You are Suhas/Suhasini. As the principal of a reputed college, you have been invited to inaugurate a Book Exhibition in your neighbourhood. Draft a reply to the invitation in not more than 50 words, expressing your inability to attend the function. You are Tarun/Tranvi. Thank you for your thoughtful invitation to the inauguration of the Book Exhibition. However, I regret to inform you that I would not be able to attend it due to a prior engagement. I extend my warm wishes to you and all those involved with the event. A newspaper report on a recent terrorist attack in your locality shattered you. You decided to write an article in a local daily on terrorist attacks and the need to maintain peace and harmony in society. Write the article in 125‒150 words. You are Madhav/Meena. India is a tourists' paradise. But we have not really exploited our tourism possibilities. Write an article in 125‒150 words on 'Tourism in India'. You are Ravi/Rani.